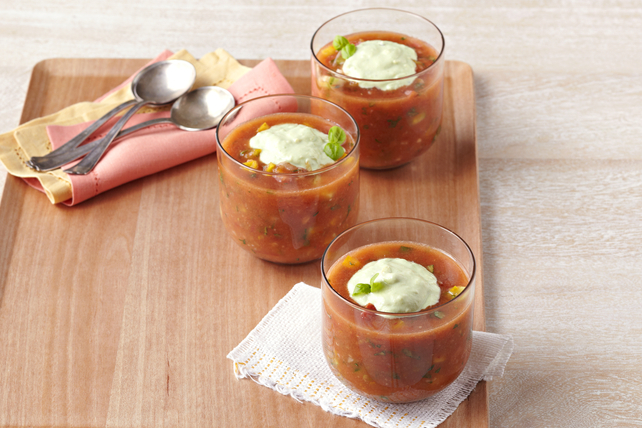 Clever time-savers, like ready-made salsa and vegetable juice cocktail, round out the fresh vegetables used to make this Garden-Fresh Gazpacho with Avocado Crema. Mash avocado in medium bowl. Stir in sour cream, lime juice and sugar. Refrigerate until ready to use. Combine all remaining ingredients except basil in large bowl. Pour half into blender; blend until smooth. Add to remaining tomato mixture with basil; mix well. Refrigerate 2 hours. Serve gazpacho topped with avocado mixture. This satisfying soup can be refrigerated up to 24 hours before serving.